Listed below are my 2014 Linebacker Rankings for IDP Redraft Leagues. I will continually update these throughout the off-season to reflect changes in free agency, defensive schemes, playing time, draft selections, etc. However, keep in mind that the information listed here is just a small sample of a much larger set of rankings and descriptions that are accessible through purchasing my 2014 Fantasy Football Draft Guide. Linebackers are undoubtedly the staples of a fantasy defense. However, I believe many fantasy owners tend to overvalue this position on draft day. There always seems to be a huge run on linebackers early in drafts as many owners feel that securing a "top tier" linebacker is essential to having a competitive fantasy defense. Although this is a fair strategy, I think more times than not, better value is to be found within other positions at the early junctures in drafts. The fact is that there are a plethora of potential LB1 linebackers (e.g. Cushing, Mayo, Kendricks, Worrilow) that can be had rounds after the Tier 1 and even Tier 2 linebackers are off the board. Additionally, IDP studs always emerge at the linebacker position throughout the season (e.g. Danny Trevathan, Paul Worrilow, DeAndre Levy, Daryl Smith, A.J. Hawk). That said, often times the best strategy is to wait until the upper echelon linebackers have been taken and then come in and start plucking up the aforementioned LB1 upside value plays a few rounds later. This will allow you to use those early round draft picks to shore up other positions where more relative value is to be found, while at the same time, not suffering significant losses of quality at the linebacker position. 1. WLB Lavonte David (TB) - David was able to build upon the tremendous success he enjoyed as a rookie and further establish himself as one of the premier, all-around linebackers in the league. His elite versatility shined through in the box scores with 145 total tackles, 2 FFs, 5 INTs, and 6 sacks. There's reason to believe these numbers could be further buoyed by the arrival of Leslie Frazier and the installation of Tampa-2 principles. This, plus the current lack of a serious every-down linebacker threat to challenge David for tackles, makes him my #1 fantasy linebacker. 2. MLB Luke Kuechly (CAR) - After a slow start to the season, Kuechly averaged a ridiculous 11.5 total tackles per game over his last 8 games which helped him win DPOY. He's still only 22 years old and is only going to get better as he gains more experience and confidence. Additionally, he's well protected by his front four which should keep him relatively free of blockers and allow him to have a more direct path to the ballcarrier. It's essentially a coin toss between Kuechly and Lavonte David for the top linebacker spot. 3. MLB Paul Posluszny (JAC) - Posluszny had a career year in the tackle department finishing 1st in the NFL in solo tackles with 121 and 2nd in total tackles with 161. The combination of little tackle competition around him and the Jaguars anemic offense should ensure Posluszny is lined up for another top 5-10 fantasy finish. 4. WLB Vontaze Burfict (CIN) - After a historic draft collapse, Burfict has proven his doubters wrong at the Pro level. He finished first in the NFL in overall tackles this past season and has surpassed Rey Maualuga as the leader of the Bengals defense. There was perhaps no more consistent week-to-week performer than Burfict who never had less than 5 solo tackles in any week. For those in fantasy leagues that don't reward for assist, feel free to give Burfict a slight bump down. But no matter how you slice it, Burfict should be a top 5 selection. 5. 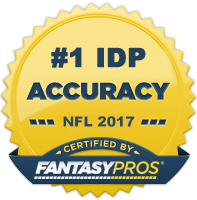 ILB Patrick Willis (SF) - It was not that long ago when Willis was the perennial #1 overall IDP pick in virtually every fantasy league. Now he's not even considered the best fantasy linebacker option on his own team. That latter belief will likely change heading into this year however as teammate Navorro Bowman will be battling his way back from a torn ACL. Willis isn't quite the linebacker he was in his mid-20's, but he's been an above average LB2 over the past couple seasons and should post elite LB1 numbers for at least the first half of the season while Bowman is rehabbing his injury. 6. WILB Karlos Dansby (CLE) - After failing to draw a ton of interest on the free agent market in 2013, Dansby found a home in Arizona where he had one of his best seasons as a pro and led the team in tackles with 121. Fantasy owners have to be quite pleased with Dansby landing in Cleveland. He will be the key cog in Mike Pettine's 3-4 defense moving forward and should be able to build upon the numbers D'Qwell Jackson was producing there in recent years. He's a virtual lock to be taken amongst the top 5-15 fantasy linebackers this year. 7. WILB Derrick Johnson (KC) - Johnson has now had 4 straight seasons of 94 or more solo tackles and managed to grow his big play numbers in 2013. He falls out of the elite linebacker tier though as the Kansas City stat crew in the stingiest in the league in terms of giving out assists (~7 total a game). That said, it's just not realistic to expect more than 15 or so assists a year out of Johnson. Feel free to draft him higher if assists don't matter in your specific scoring system, but otherwise consider him a mid-level LB1. 11. MLB James Laurinaitis (STL) - Laurinaitis failed to crack 100 solo tackles for the first time since 2010. The solid play of rookie linebacker Alec Ogletree obviously put a bit of a cap on his production. He's got decent big play upside but also gets dinged a bit in the assist category due to the Rams stat keeper. He's no longer the clear cut LB1 he use to be, but he can still provide nice value as an LB2+/LB1-. 12.WILB Paul Worrilow (ATL) - For all intents and purposes, Worrilow was the IDP surprise of the season. This undrafted rookie out of Delaware was completely off every fantasy owner until a rash of linebacker injuries forced him into every down action in Week 10 and he responded with an eye-grabbing 19 tackles. Worrilow would go on to amass a ridiculous 11.5 tackles per game over the last 8 games of the season. This said, he did grade out negatively against both the run and pass and is perhaps the least talented of this tier. However, with Sean Weatherspoon out for the season, Worrilow will have opportunity abound. And that's the name of the game in IDP fantasy football. LB1 value is possible with a relatively safe floor of LB2-. 13. WLB Chad Greenway (MIN) - Greenway has been a favorite of mine over the past few seasons as he always seems to be undervalued my IDP owners. He's been nothing but consistent since entering the league and still managed to put up a top 15 finish last year despite playing through a broken hand for a majority of the season. The Vikings have a pretty significant lack of talent at their MLB and SLB spots which only helps Greenway maintain his elite LB2+ status. 14. WLB Alec Ogletree (STL) - Ogletree proved to be an excellent fit within the Rams defensive system and managed to exceed the projections of nearly every fantasy writer. His mark of 94 solo tackles in his rookie season is an impressive feat, but I'm concerned that he may have reached a production plateau early in his career. There are only so many tackles to go around in St. Louis and barring injury James Laurinaitis will remain the team leader and focal point of the defense. He's a rock solid LB2+ choice, but I just don't see the growth opportunities to justify a higher selection. 18. ILB DeMeco Ryans (PHI) - Ryans had a bit of a career resurgence in Philadelphia posting his best numbers since his rookie season back in 2006 and finishing in the top 10 in fantasy points. He's likely to be drafted higher than this ranking in most drafts, but I have reasons to believe he will have a difficult time producing at the same rate he did last year. First off, he had the advantage of having the most snaps played by any linebacker in the league in 2013. This undoubtedly gave him a leg up in terms of racking up fantasy points. On a per snap basis, he ranked 36 in fantasy points scored behind teammate Mychal Kendricks. Secondly, Kendricks seemed to gain steam as the season wore on whereas the opposite could be said of Ryans. I anticipate a changing of the guard in 2014 with Kendricks becoming the linebacker to own in Philly and Ryans settling back down into a solid LB2 role. 19. MLB Stephen Tulloch (DET) - Tulloch had far and away his best statistical season as a Lion with 93 solo tackles, 43 assists, and 3.5 sacks. I've admittedly been a bit low on him since he left Tennessee, but he's proven he's capable of consistently producing high-end linebacker #2 numbers for us. That said, I'm bumping him up my rankings this season. Welcome back inside the top 25 Mr. Tulloch! 20. ILB Jerrell Freeman (IND) - Freeman, an undrafted free agent out of Mary Hardin-Baylor, has become an integral part of the Colts defense. He's averaged over 135 total tackles over his first two seasons as an NFL starter and grew his big play production drastically last year with 5.5 sacks and 6 forced fumbles. He loses some value with the addition of D'Qwell Jackson, but still projects to be a fairly solid LB2-.